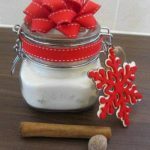 You are here: Home / All Recipes / Homemade hot chocolate in a jar : edible Christmas gift guide. 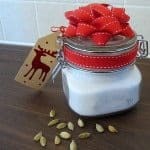 Homemade hot chocolate in a jar : edible Christmas gift guide. I am hoping it snows this winter. That way I can recreate some of my favourite winter memories for my mini chef. The dressing up in endless layers and colourful scarves to go outdoors, having snowball fights, sledging across the fields and making ‘mine are bigger than yours’ bonfires. But the best bit was coming back indoors with that tingly feeling as the blood came back to my fingers and settling down in front of the fire with a mug of luxurious velvety hot chocolate. As an edible Christmas gift idea such as this is immensely adaptable. For children you can present it as snowman’s soup topped with marshmallows and chocolate chips and the poem attached. For adults present it as hot chocolate in a jar. 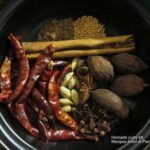 Why not add in some cinnamon or chilli for the spice lovers, some mini liqueurs to pack in some more punch, some coffee or some biscotti. Go on, try this today and please share with me your favourite hot chocolate recipe. Don't forget to tag #recipesfromapantry on Instagram or Twitter if you try Homemade Hot Chocolate in a Jar! It is really, really awesome for me when you make one of my recipes and I'd love to see it. You can also share it on my Facebook page. Please pin this recipe to Pinterest too! Thank you for reading Recipes from a Pantry. 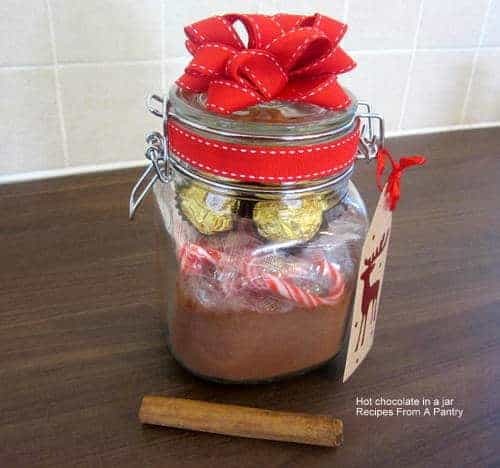 In a glass jar, layer the ingredients starting with the hot chocolate, then the peppermint sticks and lastly the Ferrero Rocher. Add mixing instructions according to the hot chocolate that you got. Decorate with some ribbon and gift tag for that lovely stylish Christmas look. 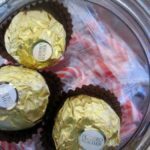 In a glass jar, layer the ingredients starting with the hot chocolate, then the peppermint sticks and lastly the Ferrero Rocher. Add mixing instructions according to the hot chocolate that you got. Decorate with some ribbon and gift tag for that stylish Christmas look.